Ever since the controversial Demonetization move, the use of virtual wallet apps (like Paytm, MobiKwik, Airtel Money, etc.,) have been on the rise. These apps allow users to easily transfer funds online between individuals and make payments to supported merchants and service providers. Such wallet based apps usually act as an intermediate between the sender’s bank account and that of the receiver. And though it’s easy to load money into these wallets, transferring funds from the wallet back to the bank account usually involves a transaction fee. Now, there’s a new way to send and receive payments directly between bank accounts without the need of a third party wallet account. What’s more, you can transfer funds from one account to the other without incurring any transaction fee. The new service, known as Unified Payments Interface (UPI), works much like IMPS payments, but is indeed more convenient and user friendly in a lot of ways. In this article, we’ll discuss in detail about the various features of the new service, how it works and its benefits over other conventional payment options available for Indian users. 6.1 Is there any transaction limit for UPI payments? 6.2 How to send UPI payments greater than BHIM’s transaction limit? 6.3 What to do if you lose access to your UPI registered phone? Unified Payments Interface (UPI) is a new payment system launched by National Payments Corporation of India (NPCI) and regulated by Reserve Bank of India (RBI) to facilitate instant payments between two bank accounts using the mobile platform. Built upon the Immediate Payment Service (IMPS) infrastructure, it enables users to integrate all of their bank accounts into a single mobile app. Additionally, it allows instant peer to peer transactions as well as payments at (supported) merchant outlets. Every UPI user is required to create a unique Virtual Payment Address (VPA) that may be used by other UPI users to send or request instant payments. A VPA is usually characterized by the “@upi” suffix, but individual banks supporting UPI also have their own VPA suffix (such as “@hdfcbank” or “@icici”). Once set up, a VPA cannot be modified; however, a user is allowed to create multiple VPAs. Think of it as an email address for payments, without the “.com” suffix. If VPA is used as the mode of funds transfer, the funds will get credited to the primary bank account, set by the receiver at the time of the transaction. This mode of payment is similar to IMPS transfers where the user’s bank account details are required. Usually, one has to provide the receiver’s name, bank account number and bank branch name / IFSC code, in order to send money to them. This mode is especially applicable for transactions between a UPI and a non-UPI user. This is another mode of payment based on IMPS where the receiver’s mobile number (as registered in the bank) along with an unique MMID, is required to send instant payments. The receiver’s Aadhaar number may also be used to send instant payments through UPI, provided that the receiver has linked their Aadhaar number to their bank account. Users need to provide a 4 – 6 digit UPI MPIN (Mobile banking Personal Identification number) for authorizing all UPI payments. The MPIN is distinct for all the individual bank accounts held by a particular user. For a successful transaction, the user should enter the MPIN corresponding to the one set for the debiting bank account. BHIM is the official iOS and Android app developed by National Payments Corporation of India (NPCI), based on UPI. It’s named after Dr. Bhim Rao Ambedkar (India’s first minister for Law & Justice) and is intended to facilitate e-payments directly through UPI participating banks. The app allows users to create their own “@upi” VPA and link bank accounts based on the mobile number registered with the bank. Currently, users are only allowed to link one bank account to their VPA at a time. However, one may change the linked bank account any number of times. Users may transfer funds by scanning the payee’s UPI QR code, entering their VPA, or by any other modes mentioned in the previous section. It supports English as well as several regional languages, including Hindi, Bengali, Tamil, Telegu, Kannada, and a few others. The app is available as a free download on the Apple App Store and Google Play Store for Indian users. This is another UPI based service launched by the Government of India. Accessed by dialing “*99#” through a mobile phone number (registered with the bank), NUUP (National Unified USSD Platform) is an alternative way of utilizing the UPI features, without an active Internet Connection. With NUUP, you can take full advantage of UPI services offline, even on a basic feature phone that supports USSD. Simply dial “*99#” on your bank registered phone number and get access to the complete list of UPI functions, such as Request Balance, Send Money, etc. You can even set or change your UPI PIN for your bank accounts, if you haven’t done so already. However, unlike other online UPI based apps, NUUP is not a free service. TRAI has set a maximum limit of ₹1.50 per transaction; but, usage charges for this service may differ for various telecom operators. All UPI participating banks include their own version of UPI integration, either through their mobile banking app or having a dedicated app for UPI payments. The features provided in these apps are universal and similar to those found in the official BHIM app, with perhaps minor variations. While using any of these apps for the first time, users are required to create a unique Virtual Payment Address (VPA), with a predefined suffix that is specific to the bank (for example, “@icici”, “@hdfcbank”, etc.). PhonePe is a third party app available on the App Store and Google Play Store, which primarily works as a virtual wallet and enables users to perform mobile recharge, bill payments, etc. But as an add-on, the app developers have also integrated UPI as one of its USPs. In a tie up with Yes Bank, PhonePe lets you create UPI addresses with “@ybl” suffix. The app supports UPI transactions using VPA, phone number (among PhonePe users), and bank account details – free of cost, over the Internet. On iOS, the app also supports Touch ID feature to validate user login, as an optional security feature. As mentioned before, UPI fund transfers are currently free of transaction charges, as long as they are initiated online through any of the partner apps. However, if you’re using the USSD based “*99#” service, your mobile operator may charge you up to ₹1.50 per transaction. The regular online funds transfer options provided by Indian banks (for example, IMPS, NEFT, RTGS), all rely on the beneficiary details to be added (including beneficiary name, account number, IFSC code / branch name), prior to the first transaction with the beneficiary. In VPA based UPI transactions, only the receiver’s Virtual Payment Address is required to transfer funds. In other words, the receiver need not provide their bank information to the sender for transferring funds. Additionally, if one uses BHIM or PhonePe apps for UPI payments, the “@upi” / “@ybl” suffix in the VPA also withholds the sender’s bank name. The concept of UPI doesn’t require the addition and approval of beneficiary prior to funds transfer. Users can directly transfer money from their own accounts to that of the receiver’s by just providing their VPA or mobile number. When sending a UPI payment using the receiver’s VPA, it is instantly verified before the transaction is confirmed to be executed. If the provided VPA or mobile number is valid, the receiver name will be displayed, so that the sender can verify that funds are being transferred to the right person. As long as the mobile number linked to your bank accounts are same, you can link multiple accounts to the same VPA, and switch between them seamlessly for UPI payments. 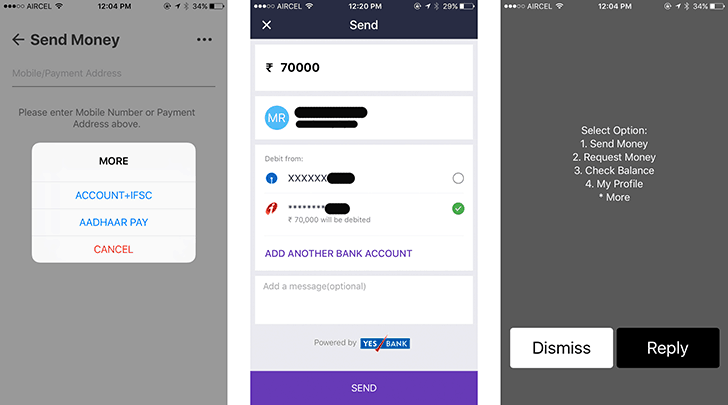 In the BHIM app, you have to select the particular bank before initiating a payment; in PhonePe, you get to choose the bank during the transaction. UPI enables almost one click payments by entering the receiver’s VPA or scanning their QR code through the supported mobile apps. The payment modes are comparable to third party wallet apps like Paytm. Only, in the case of UPI, the transactions happen directly between bank accounts without the involvement of a third party. With wallet apps, which usually use third party payment gateways, it usually takes about 5 – 7 working days to process the refund in case of failed transactions (for example, funds deducted from your bank account but not credited to your wallet account). Since there is no third party involved in UPI based payments, failed transactions are refunded almost instantly. In case you didn’t receive the money in your account after a failed UPI payment, you can refer to the following Quora thread for details on how to report the incident. As UPI payments directly occur between bank accounts, all the transactions will appear on your account statement. The inclusion of UPI payments in the transaction history, helps you keep a track of your daily expenses. The fact that UPI transactions get logged in your account statement, might be convenient to some users, but also might be annoying to others. Because UPI payments are instant and easy, many users may tend to settle even trivial payments using UPI. As a result, if UPI is used more frequently for sending small amounts of money, it will add up unnecessary micro-transactions in your account statement. If you require to keep your passbook updated all the time, doing it in this case would be certainly tedious. To tackle such situations, you might want to add funds to a third party virtual wallet of your choice, and then use the wallet balance to make micro payments among peers and at retail stores. The wallet statement, in this case, will keep track of all the micro-transactions. At the same time, your bank account statement also remains clean, as it includes only one transaction indicating the funds transferred from your bank account to your virtual wallet. But it might not always be possible for you to make payments using your preferred virtual wallet, as the receiver might not be accepting payment in that form. Though virtual wallet based payment apps like Paytm have been quite popular through the demonetization drive, some people remain skeptical about third party online services being involved in banking transactions. UPI, on the other hand, being Government approved and facilitating direct bank-to-bank fund transfers, have a higher probability of being adapted by most individuals, small merchants, and other retail outlets. Hence, another way to keep your account statement clean, is to use a secondary bank account for making micro-payments through UPI, while your main account may be used only when transferring considerably large sums of money. Is there any transaction limit for UPI payments? The official NPCI website mentions the following in their UPI FAQs section: “At present, the upper limit per UPI transaction is Rs. 1 Lakh.” Also, PhonePe’s official App Store page mentions “Instant Bank Transfers up to ₹30 lacs per month”. From the above two statements, we have concluded that, UPI payments have a daily transaction limit of ₹1 lac (₹100,000). However, the maximum allowed limit of funds transfer per day may be lower, depending on your bank. Hang on. The official UPI-based BHIM app doesn’t allow payments up to ₹1 lac. How to send UPI payments greater than BHIM’s transaction limit? BHIM is just a mobile app built on the facilities provided by UPI. As such, the ₹10,000 per transaction and the ₹20,000 per day limits are imposed within the BHIM app and not by UPI. The in-app transaction limit might be in place for security reasons. In any case, if another individual gets access unauthorized to the BHIM app on your phone, they can only withdraw up to ₹20,000 in a day. By that time, you may take the appropriate action and block your phone number if you have lost it. But, if you want to fully utilize the benefits of UPI, third-party UPI based app like PhonePe will help you to carry out instant transactions of up to ₹1 lac per day. Note: If your bank imposes a daily limit on UPI transactions, you’ll still be bound within it. That is, even though third party UPI apps support transactions up to ₹1 lac per day, if your bank only allows you to transfer up to ₹20,000 in a day, you’ll not be able to send more than ₹20,000. You may contact your bank and request them for increasing the limit. What to do if you lose access to your UPI registered phone? In case you lose access to the UPI registered mobile phone number, you can just block the number as usual. In any case, your UPI MPIN will protect your account from any unauthorized transactions, should your phone fall into the wrong hands. Additionally, it is recommended that you inform the bank authorities and temporarily de-link the mobile number from your bank account. For more information, visit the UPI FAQ section in the official NPCI website. One of the main objectives behind the launch of UPI was to encourage and facilitate the government’s “Cashless India” vision. Once UPI has been adapted as a standard payment option among individuals and retail outlets alike, it is expected to become one of the primary means of funds transfer. The added benefit of UPI’s fee-less (as of now), instant transactions is also expected to encourage users to switch to UPI.